What’s at the top of your to-do list this year? If you’re like many Windo VanGo clients here in Baltimore, you might be thinking it’s time to upgrade your window treatments so that they’re more energy-efficient and heat-saving. Now’s the time to transform your home with the Hunter Douglas Energy Smart Style Savings event, which runs until April 9, 2018. For details, speak with one of our specialists so you can enjoy savings on the following premium products. Vignette® Modern Roman Shades are like no other Roman shade on the market. They offer uniform, contoured, or flat-fabric folds with no exposed rear cords. The entire shade can be rolled up into the headrail to allow full view-through to the outside and provides insulation at the window. Duette® Honeycomb Shades are energy-efficient due to their honeycomb construction and look great in any room. Even better, Duette Architella honeycomb shades, with their patented cell-within-a-cell design, are federally recognized as an energy-efficient product. Incredibly, in the summer, solar heat gain on an uncovered window is almost 76%. When you use Duette Architella, it drops to only 15%. Like any improvement for your home, window coverings can be a major investment. 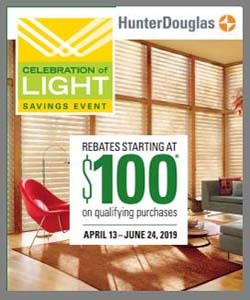 Hunter Douglas offers a complete catalog of blinds, shades, sheers, and shutters at a price point you can afford. They’re all available in a variety of styles, colors, features, and more, and you can select the best product based on your budgetary requirements, functional needs, and design preferences.